Holi, the Festival Color is a Celebration of Cheer and Joy. Holi is a spring festival, also known as the festival of colors or the festival of love. It goes by other names such as Phakuwa or Phagwah in Assamese, Dolajatra in Odisha, and Basantotsav in Bengali. It is an ancient Hindu religious festival, which has become popular in many parts of the world and with other communities. It is mainly celebrated in the Indian subcontinent, especially, in India and Nepal. The festival is also popular in countries where there is a sizeable population of Hindus such as Malaysia, Fiji, Guyana, Trinidad and Tobago, Mauritius, Kenya, and South Africa. In recent years, it has caught the attention of people in Europe, Australia, and North America as a spring celebration of love, frolic, and joyous colors. Holi is celebrated at the approach of the vernal equinox, on the Phalguna Full Moon day. Its actual date varies every year, but usually falls in February or March. The customs and celebrations vary from region to region. The festival signifies the victory of good over evil, the arrival of spring, and the end of winter. For many it is an occasion to meet others, play and laugh, forget and forgive, repair broken relationships, and express gratitude for a good harvest. Holi is also a festival of forgiveness. The celebrations are meant to generate harmony among people. Traditionally, on the day old rivalries are forgotten. Enemies declare truce and make peace. In some parts of Southern India, Holi is celebrated as Rangapanchami to signify the destruction and resurrection of Kamadeva, the god of love, by Lord Shiva. To many Hindus, the festival heralds the beginning of a new year as well as an occasion to reset and renew ruptured relationships, end conflicts and rid themselves of accumulated emotional impurities of the past. Holi celebrations start with Holika Dahan, the burning of demoness Holika. On the night before Holi, people set up a Holika bonfire in the open grounds and gather around it to sing and dance. The next day is the Holi festival, which is also known as Dhuli, Dhulheti, Dhulandi or Dhulendi. On that day people come out into the open and celebrate with colors. They organize mock fights using water jets, and sprinkle colored water and dry powder on the people around. People use water balloons filled with colored water, water guns, buckets filled with colored water or dirty water, and various other contraptions to spray color and rejoice. It is a free for all activity of fun and play, in which everyone is a fair target, be it friends or strangers, rich or poor, men or women, and children and elders. Traditionally, washable natural plant-derived colors such as turmeric, neem, dhak, and kumkum were used, but nowadays water-based commercial pigments are increasingly used besides some harmful solutions, including pain, grease, oil and even tar. The frolic and friendly fights with cheers and loud noises take place in all towns and villages in open grounds, streets, public places, and even the backyards of homes. People go out in processions, carrying drums, musical instruments, colored water and powder. They sing and dance, visit friends and family, throw colors, hug and drink. Some consume milk or sweets which are mixed with bhang, an herbal intoxicant made from the leaves of cannabis. In the evening, after sobering up, they dress up and visit friends and family. On the negative side, the fun and frolic often end up in eve-teasing and street brawls as people lose control due to intoxication and engage in verbal and physical fights. 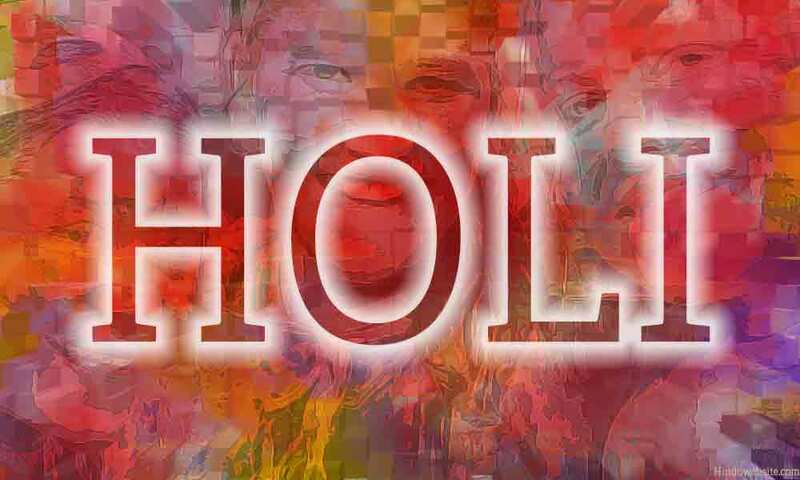 It is said that the word Holi is derived from “holika.” According to legends, Holika was a demoness, the sister of a demon king named Hiranyakasipu, who because of a boon became invincible and grew increasingly evil and intolerant. His son Prahlada was a great devotee of Vishnu, which was very much disliked by Hiranyakasipu. Therefore, to discourage his son from worshipping him, he subjected him to physical abuse and painful torture. However, Prahlada remained undeterred by all the pain and continued to worship Vishnu. Finally, Holika, a sister of Hiranyakasipu, wanted to intervene and help her brother. She wanted to trick her nephew into sitting on a burning pyre with her, wearing a magic cloak which was supposed to make her immune to any injury or destruction by fire. Prahlada had no such protective gear. He was completely vulnerable. However, as the fire grew in intensity, the cloak flew from the body of Holika on to Prahlada. As a result, he was saved while his aunt was burnt to ashes. Later, as the legend goes, Vishnu incarnated as Narasimha (Man-lion) and emerged from a pillar in the palace of Hiranyakasipu to slew the demon. Ever since it is said that people celebrate the occasion by setting up a bonfire to symbolize the victory of good over evil and the destruction of the demoness, Holika. When the fire dies down, people apply the ashes from the burnt bonfire to their foreheads. It is speculated that in the earlier days, people used the ashes from the bonfire, instead of colors, to celebrate the festival, but as time went by the tradition of using colors became common. According to some, the festival originated in the Multan province of the Punjab region where there is a temple named Prahladapuri, which the locals believe was built by Prahlada himself. Holi is an ancient festival with a long history. It is mentioned in the Puranas, the Dasakumara Charita, and by the poet Kālidāsa (4th century AD). The Sanskrit drama, Ratnavali (7th century AD) refers to its celebration. The tradition of celebrating Holi in the northern India seems to have continued through the medieval period and the British rule. Various old editions of Oxford English Dictionary, which were published after 1910, mention it as Houly (1687), Hooly (1698), Huli (1789), Hohlee (1809), Hoolee (1825), and Holi. In the Braj region of India, Holi is celebrated as the festival of love for 16 days to commemorate the divine love of Radha and Krishna. According to local legends, once a demoness named Putana tried to kill Krishna. Because of the poison administered by her, Krishna developed a darker skin. It made him wonder whether the fair skinned damsels of his village would ever consider him, a dark skinned boy, worthy of courtship. Seeing his desperation, his mother advised him to approach Radha and color her face with any color he considered fit. When he did it, Radha fell in love with him and they became a couple. Ever since, Holi has been celebrated in Braj to commemorate the playful coloring of Radha's face by Lord Krishna. In Gujrat, Holi is a two-day festival. On the evening of the first day, people light the bonfire, and offer raw coconut and corn to the fire. On the second day, they celebrate "Dhulet," with colors and other festivities. In Ahmedabad people hang a pot of buttermilk high over the streets and challenge young boys to try to break it using human pyramids. When the boys are engaged in it, girls try to stop them by throwing colored water on them. The one who manages to break the pot is crowned as king for the day. Afterwards, men take out a procession to "alert" people of Krishna's possible appearance to steal butter from their homes. In some joint Hindu families, women of the household beat their brothers-in-law with sarees rolled up into ropes as a playful banter and try to drench them with colored water. In turn, the brothers-in-law bring them sweets in the evening. In the Braj region of North India, at Barsana, a town near Mathura, women celebrate Holi with sticks (lathis) in the compound of Radha Rani temple. Since sticks are used it is also called Lath Mar Holi. On that day, thousands gather as women playfully beat men with sticks, while men try to save themselves with shields, singing at the same time provocative songs in the local dialect to instigate women. On that day, men are culturally expected to accept whatever women decide to give them. In the Kanpur area, people celebrate Holi for seven days. On the last day, they organize Gangamela, a grand fair, at various river ghats in the city along the banks of the River Ganga. The tradition was started by freedom fighters during the 1857 and continues to this day. On that day, most public offices remain closed. The celebration marks the official closing of Holi celebrations. In the Gorakhpur district of Uttar Pradesh, the day of Holi starts in the morning with Holi Milan, a special ceremony, during which people visit their friends and relations carrying colored powder and apply it to them to express their gratitude. For many people, the day marks the beginning of a new year. In Uttarakhand Holi is celebrated with music and fanfare and goes by different names such as Baithki Holi, Khari Holi and Mahila Holi. Baithki Holi, also known as Nirvan Ki Holi, is celebrated in temple premises where a special class of singers known as Holiyars sing devotional songs in classical ragas. The sequence of the songs and the selected ragas depend upon at which time of the day they are sung. For example, in the afternoon the songs are sung in Peelu, Bhimpalasi and Sarang ragas, while in the evening they are sung in Kalyan, Shyamkalyan and Yaman ragas. In the local Bojpuri dialect of Bihar, Holi is known as Phaguwa. Here people prepare the Holika bonfire with dried cow dung, wood from local trees known as Araad and Holika, dried leaves and grains from the fresh harvest. On the day of bonfire, they gather in public places. A senior priest sets it on fire to mark the beginning of the celebrations. The next day, Holi is celebrated with usual festivities, with colors, song and dance, sweets, and intoxicating drinks. People visit friends and family either on the same day or the next day. In West Bengal, Holi goes by the name of "Dol Jatra," "Dol Purnima" or the "Swing Festival." On that day, images of Krishna and Radha are placed in palanquins and taken in public processions. Youngsters wear garlands and saffron colored dresses or white dresses and sing and dance to the accompaniment of musical instruments like ektara, dubri, veena, etc. Some take turns to swing them, while women dance around them in a circle singing devotional songs, and men keep spraying them with colored water and powder. The head of the family observes a fast and worships fire god, Agni, and Lord Krishna. At the end of the ritual he smears the images of the deities with colored power and offers them bhog. In Shantiniketan, Holi is celebrated with music and good food made of traditional dishes that include malpoa, kheer sandesh, basanti sandesh (saffron), saffron milk, payash, and other items. In Odisha people celebrate Dola on the day of Holi and worship Jagannath instead of Krishna. They take out the deity in public procession and make offerings to him, which is known as Dola Melana. The practice seems to be an old custom. In Assam Holi is called Phakuwa, is celebrated all over Assam over two days. On the first day, in some parts of Assam, people burn clay huts instead of bonfires, and celebrate Holi the next day with color and festivities. Songs are also offered to Lord Krishna. People of Goa celebrate Sigmoh or Sisir as their spring festival, which lasts for about a month. During that period, they also celebrate Holi. The Holi festivities include Holika Puja and Dahan, Dhulvad or Dhuli vandan, Haldune or offering yellow and saffron color or Gulal to the deity. In Maharashtra, Holi Purnima is traditionally celebrated as Shimga, which lasts from five to seven days. On the day of Shimga, people burn bonfire. Each family brings a meal and a dessert, usually a delicacy called Puran Poli, in the honor of Agni, the fire god. Holi is celebrated with color on the day of Rangapanchami, which falls five days after Shimga. Manipuris celebrate Holi for 6 days along with the festival of Yaosang. The celebrations begin with the burning of a thatched hut of hay and twigs. On the first two days, children go out and collect nakadeng, or gift money, from the households. In the night, young men perform a group folk dance called Thabal chongba, with folk songs and music. In the temples, devotees wear yellow turbans and worship Krishna with devotional songs, dances, and aber (colored powder). On the last day of the festival, in some areas, people take out large processions near Krishna temples and engage in various festivities. In some places, people enjoy playing various sports, including a local sport called Yaoshang. A local version of Holi called Ukkuli in Konkani, or Manjal Kuli in Malayalam, is celebrated at Gosripuram Tirumala temple. In Karnataka, Holi is celebrated for two days. The Holika bonfire is lit in the memory of Kamadeva, the god of lust. Holi is celebrated the next day with usual fanfare. Holi is celebrated every alternate year at Sirsi for six days. For five days, a unique folk dance called "Bedara Vesha" is performed during the nights, and on the sixth the actual festival is celebrated. The event attracts a large number of people from different parts of India. A few decades ago, Holi was relatively unknown in many parts of Andhra Pradesh. A few groups and immigrants from the North might have celebrated it in the urban areas. Students in rural areas used to sprinkle ink from their pens on one another. Even that was discouraged since the festival was not well known. However, in recent times it has gained popularity due to television, films and media. Holi is now celebrated in many parts of the state along with Basanta Panchami, with usual festivities, color and pomp. Traditionally, in some rural areas of Telangana, Holi is celebrated in honor of Lord Kama. People collect money, rice, corn and wood for the bonfire and celebrate the Kamudha night. Nowadays, the festival is celebrated all over the state in many urban and rural areas as elsewhere. In Jammu & Kashmir, Holi is celebrated in the regular manner with color, singing and dancing, as in other parts of Northern India. The festival marks the beginning of summer harvesting season in which many Muslims also participate. In Punjab, Holi is celebrated for two days with a lot of fanfare. In rural areas, people decorate the walls and courtyards of their houses with traditional drawings and paintings known as chowk-purana, which include drawings of tree motifs, flowers, ferns, creepers, plants, peacocks, palanquins, geometric patterns with vertical, horizontal and oblique lines. They make the festive season colorful. In most areas of Madhya Pradesh Holi is celebrated as elsewhere, with some local variations as dictated by tradition, customs, or convenience. In Tamilnadu, Holi is celebrated as Vasantha Uthsavam, on the Phalguna full moon day, which is known as Panguni Uthram. It is so called because on that day the full moon and the star Uthiram are seen together in the sky. It also happens to be the wedding anniversary of many celestial deities. On that auspicious day, Goddess Mahalakshmi said to have manifested from the waters of milky ocean as the gods and demons churned the oceans in search of elixir (amrit). People celebrate in temples and public places to mark the occasion with colors, decorations, music, spiritual discourses and the traditional art of storytelling, known as Harikathas. Holi is currently celebrated in all countries outside India where Hindus are present. In countries like Nepal, Sri Lanka, Suriname, Trinidad and Tobago, Guyana, Fiji, Mauritius, UK, Kenya, South Africa, Uganda, Tanzania, Nigeria, Australia, New Zealand, Malaysia, Bali in Indonesia, Singapore, and even Pakistan and Bangladesh, where sizeable Hindu population is present, it is celebrated on a wider scale. In most countries, people follow the traditional format, with or without the bonfire (Holika) due to local restrictions on the use of fire in public places. On the day of Holi or around that time community leaders organize special events, and invite people to participate. People come prepared for the event and in the spirit of Holi they play with colors and exchange pleasantries. However, due to local restrictions, the celebrations are organized in private places rather than in the streets and public places. On the positive side, the festival of Holi brings people together, repairs broken relationships, and helps people enjoy a few days of fun filled activities. On the negative side, the very nature of the festival often results in public commotion, harassment of men and women, personal and group rivalries. Not all people would like to be drenched in color, since of the colors and solutions are sticky and pose a problem to personal hygiene. The festivities and the throwing of color disrupt the normal working hours and cause considerable loss to the businesses. Due to slack regulations and the liberties taken by some trouble makers and sociopaths, the chemicals used in the preparation of the color dyes may result in mild to severe skin irritation or even blindness. According to a study conducted in 2007, the Malachite green, used in the preparation of some colors which are used during Holi, was responsible for severe eye irritation. The actual impact of the chemical is yet to be fully ascertained. According to another study made in 2009, the colors used in Holi contained metal based industrial dyes which could potentially result in cutaneous (skin related) problems when they were applied to normal skin. These studies created awareness among many for the need to celebrate Holi with restraint and use natural colors instead of colors made of synthetic and industrial chemicals. There is also a growing concern among people regarding the environmental effect of bonfires that are lit on a massive scale in various parts of India. General disclaimer: Information for this article has been drawn mostly from the Wikipedia article on Holi. Hinduwebsite does not make any guarantee of the validity of the information, which is provided here or elsewhere in good will, without any implied warranty of fitness for any purpose or use whatsoever. None of the contributors, sponsors, administrators or anyone else connected with Hinduwebsite in any way whatsoever can be responsible for the appearance of any inaccurate or libelous information or for your use of the information contained in or linked from these web pages.